Expect DJ friendly Dub / Dancehall, sprinkled with some cute and sunny 8bit vibes and decked out with hand-picked vocalist bigshots. The chilled and bumping sound has been praised internationally as well as by ‘that Rob Da Bank bloke’ and is a very VERY long awaited release …we were honoured to be asked to work on it. Its worth mentioning that the brief was quite a challenge – so, yeah – thanks Richie for pushing us, we can’t wait to get our hands on the finished artifact – released very soon by Canada’s Balanced Records. Photos of both sides to follow soon. 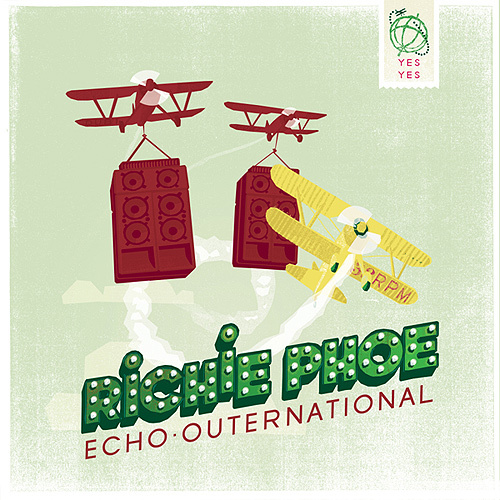 This entry was posted in Publications, Uncategorized and tagged album artwork, art, Balanced Records, biplane, commission, dancehall, design, dub reggae, Echo-Outernational, Flying Circus, petting zoo, Richie Phoe, Typography. Bookmark the permalink.